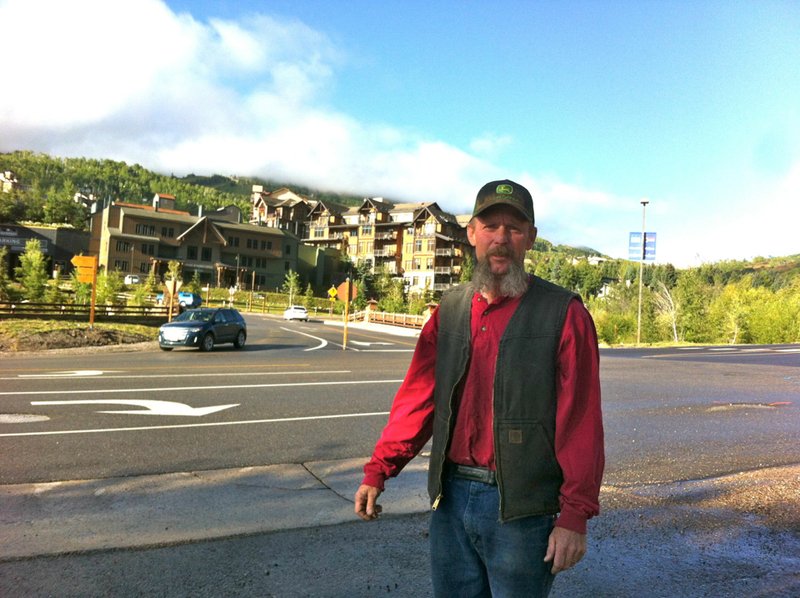 Jeff Head, an owner of the Snowmass Conoco, standing across from the intersection of Brush Creek Road and Wood Road. A new roundabout there could make it harder to get to the Conoco station. SNOWMASS VILLAGE – A roundabout for the busiest intersection in Snowmass Village has been envisioned for at least a decade. Originally conceived as part of the 2004 Base Village approval, the traffic circle’s challenges are now becoming apparent as the project design enters its home stretch. Steep sections of Brush Creek Road will need to be regraded above and below the intersection with Wood Road in order to provide a level “bench” for the oval-shaped roundabout. Kearns Road could require a 20-foot high retaining wall near Town Hall to make the current roundabout design work. A relocation of underground water lines beneath Kearns also will be necessary. Access to the town’s only gas station will be more challenging for delivery trucks and for vehicles traveling downhill, which would now be required to make an additional turn after driving through the roundabout in order to get to the gas station. Barger was involved in the design and implementation of the first Snowmass roundabout, at Brush Creek and Highline roads. But he said the size and scope of the Wood Road roundabout is comparable to the one built near the Willits development in El Jebel. The Snowmass site is complicated by other factors, not the least of which is the road grade. Where the roundabout would be placed must see a 1 percent reduction in grade, from 5 percent to 4 percent, in order to provide a flat bench, Barger said. That comes with its own set of impacts. “When you bench something like that, you end up with steeper grades, above and below the site,” Barger said. So before the bench can be built, a section of Brush Creek Road beginning near the BJ Adams offices and continuing about 300 feet uphill will need to be regraded. A 10 percent road grade could result in one section. Buying property was easy, by comparison. The owners of the Snowmass Resort Conoco, a town mainstay for more than 30 years, have their own set of concerns related to the project. Jeff Jandegian, business co-owner along with Jeff Head, thought his problems were over two years ago when the partners finally purchased the property out of foreclosure, for $800,000. Before the recession, it was listed for $2.5 million. Securing ownership of the land may turn out to be easy, by comparison. Jandegian told elected officials this week that the gas station owners hadn’t been invited into the design process until the concepts were almost fully developed. “We had no input until we saw the design,” which will require the station giving up between 15 to 20 percent of its usable land for the project, he said. What the Conoco owners consider to be a greater affront is that the design will require an additional turn movement for access. As currently drafted, vehicles coming downhill will have to drive through the roundabout to Kearns Road and from there make a right turn into the filling station. Now, vehicles can make a straight shot from Brush Creek Road into and out of the Conoco. “I’m giving up 50 percent of the ability to come in and out” of the station, Jandegian said. He added that the new access point will place a particular strain on large delivery trucks. Barger said design input was received from Base Village developer Related Colorado, the town, the Roaring Fork Transportation Authority and the Snowmass Water & Sanitation District. He added that what’s complicating matters is that the roundabout must line up directly with the Wood Road bridge, which was completed in the mid-2000s by the town and the original Base Village developers. 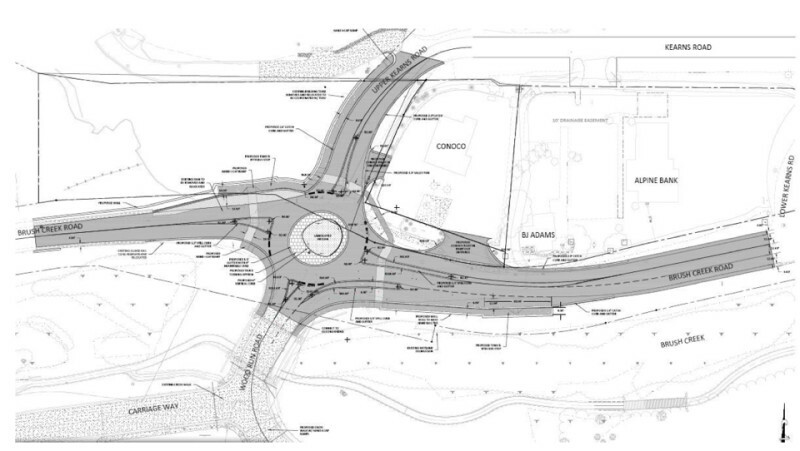 A diagram of the proposed roundabout at Brush Creek and Wood roads. The roundabout, upgrades to Wood Road and the aforementioned bridge were some of the developer mitigation requirements tied to the original Base Village agreement. Traffic at this intersection already receives failing marks for “level of service” on high-volume days, Snowmass Village transportation director David Peckler said. Included within Related Colorado’s plans to restart the base area project is a promise to build the traffic circle, which in the original phasing schedule was envisioned for completion around 2007. That schedule was upended by property ownership changes and bankruptcy. Today, the roundabout tops a list of project “milestones” being used as leverage within back-and-forth negotiations between the town and the developer. The design and construction of the roundabout are estimated at $3.5 million. In the 2015 road fund, the town has $800,000 budgeted for its share, according to town finance director Marianne Rakowski. Pedestrians may find crossing this busy intersection to be less intimidating, but potentially less convenient, with the roundabout in place. Today, crossing from the Snowmass Center to the ski area side of the road requires traversing between 50 and 70 feet of pavement, according to the engineer. A pedestrian was seriously injured last spring after being struck by a vehicle. The roundabout design directs pedestrians to cross one lane of traffic at a time. A median provides a place to wait before crossing another 12 feet of pavement. If asked his opinion, Jandegian would recommend stop signs for the intersection rather than a roundabout. “I think that a four-way stop with a really nice bridge for people to cross the street makes more sense,” he said. The town does not favor traffic lights for its intersections. The road redesign and roundabout will take an entire construction season, if not longer, to build. “The ideal situation if we get in by April 15, they could potentially be out by late October or early November,” Barger said. That may not provide much comfort to the adjacent business owners. Jandegian said he was told that when a roundabout was constructed in Silt, the affected gas station saw its business drop by nearly half. He finds that unacceptable. “I didn’t do this for 32 years to leave the town without a gas station,” Jandegian said. Barger said the design for the road and the proposed Kearns Road retaining wall are neither complete nor etched in stone. But what he is positive about is the current state of Snowmass Village’s main intersection, which functions poorly and is dangerous to pedestrians. He added that, “roundabout designs have evolved” since the first Base Village approval was passed in 2004. Editor’s note: Aspen Journalism and the Aspen Daily News are collaborating on coverage of local governments. The Daily News ran this story on Saturday, Sept. 13, 2014. Follow journalist Madeleine Osberger on Twitter, @Madski99.